“The women hikers stood on the narrow path, their weary backs resting against the cool rock face of the cliff. They caught their breath and allowed the revelation of their ultimate purpose to sink in: they were on nothing less than a quest for their very future; they were on a sacred pilgrimage for love.” As Cecilia Velástegui makes clear in her epic saga Missing in Machu Picchu, these delusional dames are unlikely to find true love: Owing to a series of mysterious coincidences, they are in the thrall of a lady-killer. Rodrigo is a to-die-for, handsome megalomaniac posing as a tour guide; he has lured a flock of willing flirts to Peru, where he promises to take them on a perilous hike to Machu Picchu, the “city of the Incas” high in the Andes Mountains. Rodrigo has an eye for conquest, convinced he is an Incan god; the women—Gabby, Hilary, Tiffany, and Mercy—have come to break their addiction to Internet dating and find lasting love. Each of them secretly believes she will find it with Rodrigo, little suspecting how evil and corrupt he really is. Velástegui, an International Latino Book Award author, has crafted this story like the mystical patterns of the shawls that Taki weaves. In her creation the author draws together threads of her own life. Born in the Andes Mountains of Ecuador, Velástegui was raised in California and France, speaks four languages, and stalks the globe in search of her stories. 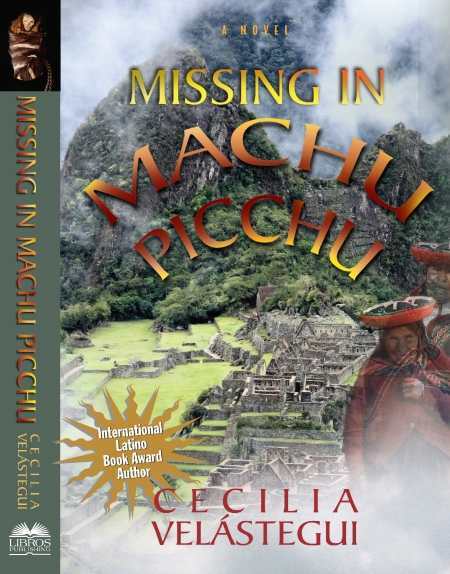 Missing in Macu Picchu is more than a thriller. Velástegui wants her readers to not only be enchanted by this tale of seduction, vengeance, retribution, and, for one character at least, atonement, but also to be educated about Latin American culture and mythology: the legends, the history, and the classic clash between earthly desires and the will of the gods. She has included photographs of sacred Incan shrines, mute and eyeless mummies, and the recently discovered “ice maiden.” A lengthy bibliography and a study guide appear at the end of the book. Velástegui’s prose is dreamlike and evokes comparisons with the best writers of modern magical realism. The simple lives of peasants and the complex schemes of city slickers reveal special meaning when drenched in the romance, violence, and pure zaniness of folk memory. Velástegui brings the genre up to date, with peasant grannies struggling to understand computers and identify with their clever but insensitive grandchildren, and college-educated women forced to do battle with ancient spirits and cosmic forces well beyond the reach of the worldwide web.